Do you sometimes face difficulties in transporting some cargos? 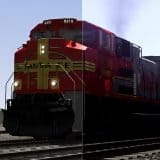 It shouldn’t be a problem anymore – with Trainz Railroad Simulator 2019 Freight Wagons Addons you can solve it instantly. Trainz Railroad Simulator 2019 Freight Wagons Mods is a great opportunity for everyone, who wants to take more from the game. All you need to do is press Trainz Railroad Simulator 2019 Freight Wagons Addons download of the file you like. There are no payments, therefore everyone can use Trainz Railroad Simulator 2019 Freight Wagons Mods free files without limits. Players enjoy TRS 2019 Freight Wagons Addons for a certain reason – it makes you succeed faster. How could refuse that? Not you! So, check what we have to offer in our TRS 2019 Freight Wagons Mods list and let the adventure begin! It will make your playing experience remarkable and exciting as never before. But enough talking, it’s your time to act and take everything you can!